You know him, you love him, Our Media contact, the Machinegun Moses, Aaron Krieger. Our guest tonight loves shooting, collecting, talking about and working on guns. He runs a gun & gear based website and Youtube channel, the owner/founder/editor for HausofGuns.com, Please welcome Ebbs! Tonight we are going to do We Like Shooting Theater sponsored by Manticore Arms. Where we re-enact movie scenes, our style. Tonight we will perform a scene from “AN OFFICER AND A GENTLEMAN”. Foley will be played by Jeremy and Zack will be played by Savage. Foley: Why would a slick little hustler like you sign up for this kind of abuse anyway? Zack: wanna fly jets Sir! Zack: I wanted it since I was a kid! Zack: I’ve changed. I’ve changed since I’ve been here. Foley: The Hell you have. Foley: Nahhh……. You just polished up your act a little bit. You just SHINED it up! Don’t tell me what I wanna hear. <brief pause> I want your DOR! Foley: <Louder> I want your DOR! Zack: I ain’t gonna quit! Foley: Spell it! D - O - R.
Foley: Yeah, then you can be free, and you and your daddy can get drunk! And go whore chasing again! Foley: Alright, then you can forget it - YOU’RE OUT! <breathing heavy - desperately> I GOT NO WHERE ELSE TO GO! <heavy breathing/defeated> I got nothing else. We will be at the bullpup shoot in Illinois on September 19th. This is a big chance to shoot some great guns and hang out with awesome people. Go to bullpupshoot.com to find out more! Thanks to Manticore Arms and don’t forget you can get all kinds of awesome accessories for your rifles! Check out their new ALFA rails for your AK at ManticoreArms.com. Seriously, go check them out. Visit them at manticorearms.com to see their full product line and what they have to offer. Manticore Arms is a proud sponsor of the We Like Shooting show. Please go to http://welikeshooting.com/manticore to say thanks! Charleston Shooter arrested, NRA member made a bad call considering the time frame, but the logic behind it was correct. Puerto Rico scraps gun registration and institutes constitutional carry. Uber bans passengers and drivers from carrying firearms. Kind of weird after an Uber driver stopped a mass shooting in Chicago. 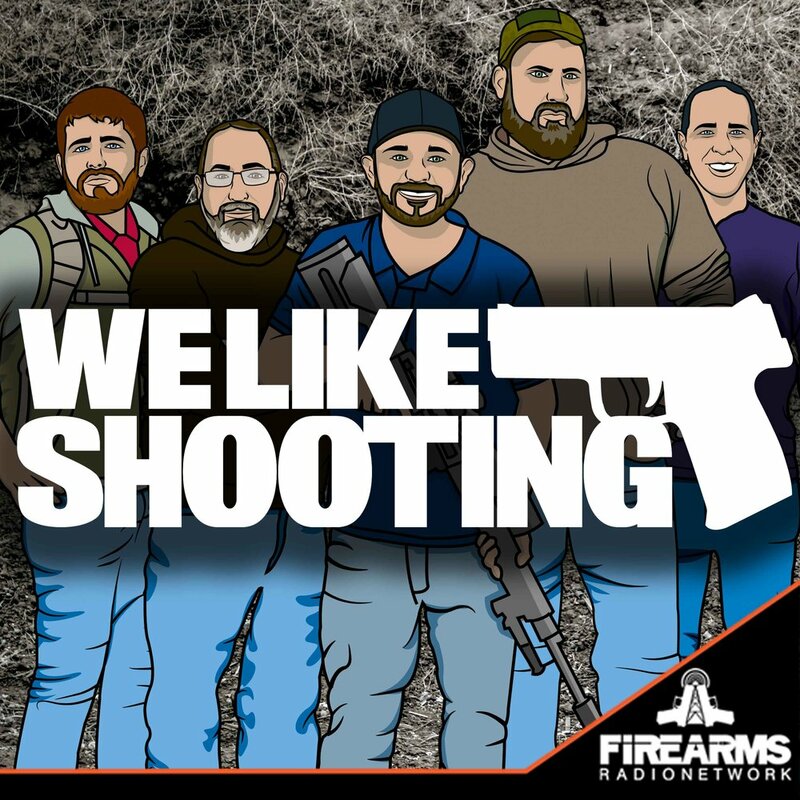 Most entertaining gun related pod cast! Great cast and very entertaining. I like that that they don't seem to take themselves too seriously and they are just as devoted to education of firearms as I am. One of the best! Keep it guys and gals! Hey guys great show!I'm surprised at how much Jeremy knows about Gummo, then again, ...I'm not. Thanks for picking my review Lil. Don't worry about sending the patch. Just say hi to Dan for me. He sounds like a super cool guy! I love your show, it's informative, funny and serious all at the same time. I look forward to it every week! I would like to thank Jeremy for talking about the Ruger GP100 as due to him getting one I figured that if he likes it then it has to be a great gun so I picked up a GP100 Match Champion....wonderful revolver!And Shawn, as a fellow Coloradoan in North Front Range I am constantly watching the state and know that we now have some great representatives in office with Former Sheriff Cooke in the state and former Weld County DA Ken Buck in Washington....we just need to make some changes this coming election to get our rights back.Again thanks for all that you do and maybe sometime I will get down your way and meet ya! Take Care and keep up the good fight! Write the obituary of your favorite cast member, maybe in 60 years we’ll actually use it! Leave a review guessing what each cast members favorite movie of all time is. Next week we will reveal! Write a couple of sentences to describe a movie that Jeremy would star in. Our sponsors are the best, but we couldn’t survive without our patrons! We’ll make you a deal, you agree to support us and we will send you cool stuff AND the best part is you get rewards back. We’ve given away thousands of dollars worth of guns in the last several months! You are missing out! We are giving away more at $800 per episode. We’ll figure out what in the next couple of weeks! Just a reminder to join a gun related advocacy group and we always give out the Suicide prevention line, If you’re in crisis, text the word START to 741-741!